Posizione collinare privilegiata con bella vista, vicino alla città. DISTANZE: Lucca km. 9 – Firenze km. 79 – Pisa km. 35 – Versilia mare km. 25, montagne Garfagnana km. 40, Volterra km. 80, Siena km. 155. Accogliente casa in stile rustico toscano con piscina in bella posizione panoramica circondata da alberi di olivo e vigneti sulle colline nei pressi della città di Lucca. La casa, completamente indipendente, si trova a pochi chilometri dalla città di Lucca e anticamente faceva parte della proprietà dell’antica villa nobiliare che si trova a circa 50 mt., in posizione dominante sopra di questa e abitata nel periodo estivo dai proprietari. al piano terreno cucina ben equipaggiata (zona griglia, lavastoviglie, forno e fornelli con fuochi a gas, frigo con freezer, microonde, tostapane, bollitore), piccolo ripostiglio con lavatrice (ferro da stiro), 1 bagno con doccia e servizi, luminoso e spazioso soggiorno con camino, TV. Al piano superiore 1 camera matrimoniale con bagno annesso (doccia e servizi), 2 camere doppie, 1 bagno con doccia e servizi. Posto macchina riservato esterno, collegamento internet Wifi gratis. Riscaldamento a GPL. All’esterno di fronte alla zona soggiorno in posizione panoramica si trova la spaziosa veranda coperta attrezzata (BBQ). Poche decine di metri, nel giardino della villa soprastante accessibile attraversando una piccola strada di campagna, si trova la piscina circolare del diametro di mt. 10 profonda mt. 1,40 in uso comune con i proprietari (obbligatorio sorvegliare i bambini) con spazio relax riservato. UTILITA’: buon ristorante a km. 1,7 – supermercato ed altri servizi a km. 6 nel paese di S. Alessio. l'eventuale uso del riscaldamento che verrà addebitato a seconda del consumo, la tassa di soggiorno. Deposito cauzionale Euro 200 da versare al proprietario al momento dell’arrivo. Salve, mi chiamo Elisabeth e sono danese ma ho vissuto in Toscana, nella città di Lucca, per 18 anni. Con la mia agenzia Danitalia da circa 20 anni affitto case e appartamenti per vacanze, immobili che seleziono personalmente secondo precisi criteri (essendo danese sono abbastanza critica sugli standard qualitativi) e che mi sento di consigliare ai miei amici e parenti che vogliono visitare l’Italia. No problem staying here during winter. The heating works perfectly but it is and extra cost because it is difficult to know how much you will use it. Bed linen is FREE. We will do the beds for you with nice new linen. They will be changed once a week. If you prefer to change more often, that can be arranged at a small extra. You can park the car close to the villa - space for 2 cars. The internet is well - working! Towels are FREE. We provide good towels as well. They will be changed once a week. If you prefer to change more often, that can be arranged at a small extra. Fully equipped kitchen opening to the living room. There is everything you need for cooking and do the table. Fully equipped cozy country kitchen opening to the living room. There is everything you need for cooking. The garden around the villa is private for you and you will not have to share with anyone. You have a private and undisturbed veranda furnished for outdoor eating. The view over the hills and Lucca town is fantastic from here. You will share the pool with the owners if they are in their summerhouse but for many periods they live in Lucca town. You have your own covered veranda with sunbeds next to the pool. 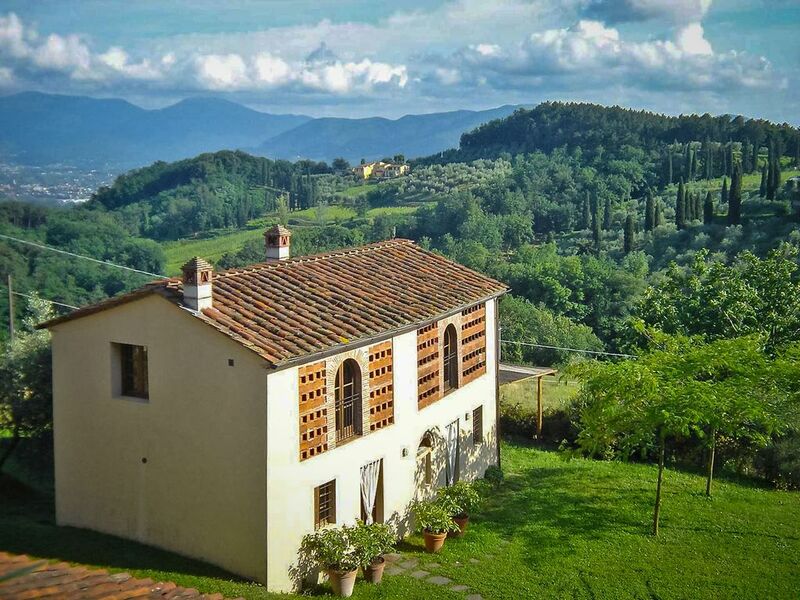 Agli Orti is on the countryside yet close to Lucca so we did different trips around Tuscany while staying in this wonerful. It is very centrally located. The house was very well prepared for us, clean and fresh. We were really amazed by the view from the terrace. Thanks to Barbara who greated us at arrival and Elisabeth for all the tips regarding the area. It is a wonderful house - maybe the best we ever rented in Tuscany! Just like the pictures - maybe better. The view is absolutely incredible. We are so happy that we chose Agli Orti for our Lucca holiday. Everything was just as we wanted. On the countryside yet close to Lucca. The house was clean and the beds well prepared. Barbara was there to show us around when we arrived. Thanks for all the advice regarding the area. Elisabeth arranged for a mamma to cook for us one evening - that was great and we loved not having to drive after dinner! The booking through this site was easy and we really appreciated that Elisabeth answered so fast when we had any questions. First time in Lucca but we will be back. Probably the best view in Tuscany! We have beeing travelling a lot around Tuscany but we have never stayed a place with such a view. Absolutely amazing. The house was clean and well prepared. Barbara who opened was service minded and gave us advice about the nearby restaurants - we visited Vipore which is close and has a very nice terrace. Lucca is just down hill but you will need a car to stay here. Elisabeth arranged for a cook one evening. That was great.